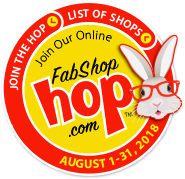 FabShop Store is part of The Fabric Shop Network...the trade organization for independent quilt and fabric shopowners and design studios. Our goal is to help business owners grow, succeed, prosper, and enjoy business to the fullest. We strive to provide the most complete, comprehensive, and detailed source of business information and educational tools available within the fabric retailing industry. Members of the FabShop Net Retailers' Association present a unified voice for independent fabric and quilt shops within the industry! Use the Association's combined buying power and services to contribute to your bottom line by saving you money!